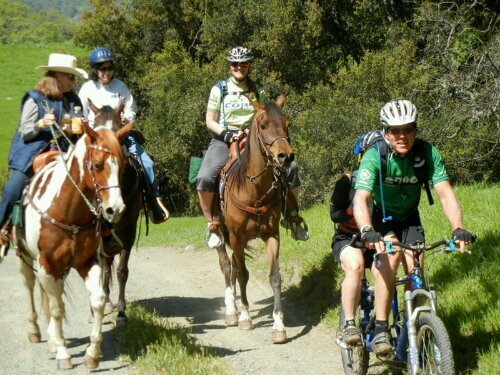 Today, Sunday April 10, about one hundred trail users descended upon Sunol Regional Wilderness Park in the Bay Area’s East Bay Regional Parks district. But this was no ordinary group of trail users. Among the multi-use advocates were about 40 mountain bikers, 30 hikers and 30 equestrians, all riding together as a diverse group. Today’s ride was a clear demonstration that multi-use principles can work. 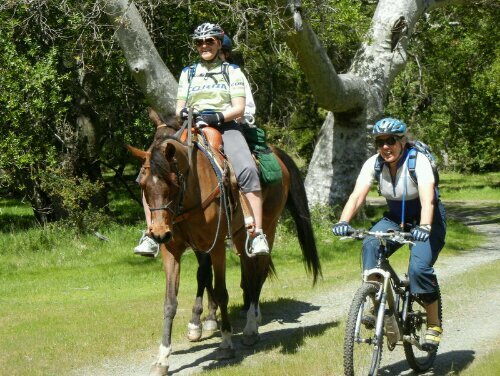 Cyclists, Hikers and Equestrians can share trails successfully when there is mutual respect from each group. One of the cyclists, a CORBA friend in a CORBA jersey, even swapped “vehicles” with an equestrian (pictured). Events like this bring the trail user community together and everyone wins. The day started with a fire-road climb to Camp Ohlene, where lunch was served. For the return trip the trail chosen was a very narrow singletrack with some exposure, that is normally closed to bikes and equestrians. It was about six-miles each way, with 1400′ of elevation change. Even on narrow singletrack trails like this, everyone can peacefully co-exist no matter how they choose to experience our open spaces. CORBA board members Danusia Bennet-Taber and Steve Messer, and CORBA Advisor and founding Director Jim Hasenauer are among the conference attendees, along with representatives from mountain bike advocacy groups from as far away as San Diego and Arcata. It’s a great opportunity to network with trail advocates and land managers and learn from each other, working towards our common goals. Over the coming days there will be multiple presentaitons on best-practices for trail design, trail maintenance and management. Among the presenters are CORBA founder Kurt Loheit, a nationally-recognized trailbuilding guru, Nat and Rachel Lopes of Hilride, representatives from California State Parks, California Department of Transportation, the Alliance for Biking and Walking, and numerous land managers, trailbuilding experts, advocates and volunteer program coordinators from around the state. The conference gets underway on Monday, April 11 with a series of day-long concurrent workshops. Over the following days there are over 80 concurrent sessions covering topics as broad and diverse as California’s trails.